This group of 22 metal Bell & Co matchboxes containing 'strike anywhere' matches was excavated from outside Shackleton's hut in Antarctica. 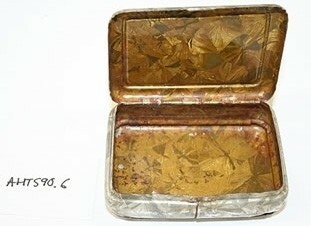 A few of the tins were deformed or had holes in them, but the majority of the tins were well preserved, having only some corrosion and loss of their coating. Inside the boxes, the matches had lost most of their red phosphorous coating, which sat as dust inside the tin. There was also a piece of purple card in each of the boxes which probably held the matches in place. This group of objects posed a number of conservation problems to conservator Fiona Cahill and myself. What should we do with the corrosion on the tin, what could be done to ensure that there were no further losses of phosphorous on the matches and how could we safely remove the remains of the dust and dirt from the yellow coated surfaces of the matchboxes? First, we carefully removed the matches one by one from the tin and dipped the coated end into a consolidant. This treatment is irreversible as the subsequent removal of the consolidant would cause the loss of the phosphorous coating. However if no consolidant were added, this would occur anyway. The matches were then left to dry in a specially made 'cribbage' style board to protect the drying consolidant. 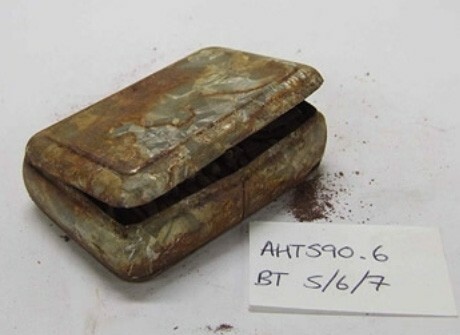 We found in tests that the yellow coating on the tins was not soluble in water and so the coating inside of the box was dusted out using a brush and then swab cleaned using deionised water. 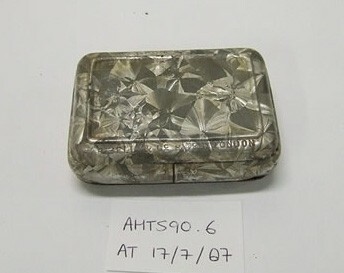 The exterior of the box was cleaned mechanically, and where no coating existed, as in the case of AHT590.6 shown in the images here, small amount of an abrasive polish was used and then carefully removed. 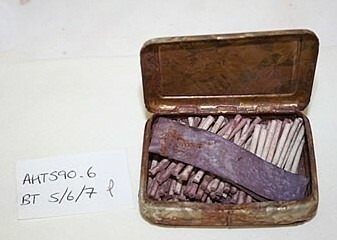 Once the box was clean and the matches fully dry, the matches could be replaced into the boxes and the purple card reinserted above them to hold them in place. 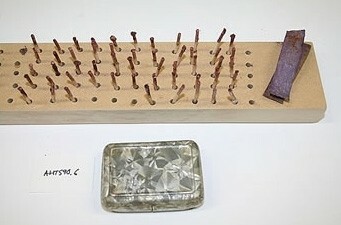 Cribbage-style board used to dry matches after consolidation of the phosphorous.